In 1810, that poetic vandal Byron carved his name into the columns of the temple of Poseidon on the coast at Cape Sounion near Athens. When a later Hellenophile author visited the same spot a couple of centuries later, another feature of the landscape caught her gaze. “There are these moments that happen, or places I go,” explains Victoria Hislop about the alchemy of a haunting place and a dramatic past that has turned her two historical novels into solid-gold bestsellers. At Sounion, “I was taken there to see the sunset by friends. It’s magical: no doubt about it. But what really interested me was this dark shape just off Sounion – which is Makronissos.” About this sinister “long island”, “They were very cagey”. Hislop’s research, which feeds into the latter part of her third novel The Thread (Headline Review, £18.99), revealed that the island had for three decades after the Greek civil war of the 1940s served as a concentration camp where Communists and other radicals were jailed, tortured and “re-educated”. Her Med-set period romances may fill a million holiday suitcases. Yet she has brought something fresh, unusual and rather intrepid to an often vapid genre, with a tenacious attention to the tangled and controversial history that fuels her plots. Civil strife in Greece ignited when, as the Resistance gained the upper hand over the occupying Germans, it grew clear that the Allies favoured the conservative forces. The left-wing fighters of the ELAS movement would not share the fruits of victory. Many readers of Captain Corelli’s Mandolin will recall Louis de Bernières’s ferociously anti-ELAS take on this bloody falling-out. Hislop approaches the history from a very different angle. Chart-topping popular fiction rarely if ever sets out to navigate such stormy seas. The astonishing impact in both Britain and Greece of The Island, her debut novel in 2005, first pointed to Hislop’s flair for mixing bitter-sweet cocktails from the gentle sensations of a sun-dappled Mediterranean romance and the sour tang of a painful, and unresolved, past. That book took its army of readers to another offshore domain of secrets, the Cretan leper colony of Spinalonga. But, for all the hidden misery it unveiled, The Island healed more than it inflamed. Hislop now calls it “quite a naïve book” as well as “a very, very affectionate portrait of the Greeks – certainly of Crete. It’s meant to be. I love that place. I absolutely do.” Her family – husband Ian, Private Eye editor and stalwart fall-guy of Have I Got News For You, and their two children – have a house on Crete, where she retreats to write. She has just returned from Crete, fretful about friends’ prospects amid their nation’s still-simmering financial crisis, when we meet in a club near Trafalgar Square on a day of Greek-standard sunshine. Ian – who also studied English at Oxford, and in the same year – never reads her novels until she writes “The End”. “I’m good at taking criticism, but not from him… I try to make it the best it possibly can be before he sees it. It must be very annoying for him, because I don’t share. But he knows what country it’s set in because I keep going there, and books lie around.” With The Thread, however, he did suggest a crucial change to the ending, “and I knew he was right”. 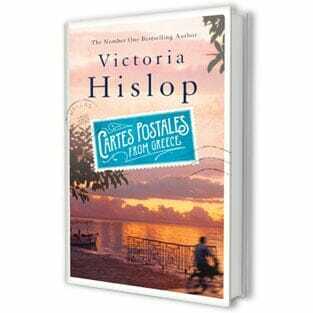 Did Victoria Hislop ever consider publishing her fiction under another name? She explains why not. “I was working, when I got married to Ian, for a big PR company that was owned by Tim Bell”. This “megalithic organisation” of spinners won the contract to promote the NHS reforms of the late 1980s. “I was somehow part of this team that represented these ideas to the public.” Thus, in the Whitehall offices of the department of health, “I was handed the White Paper, marked ‘Top Secret'”. At the time, she still used her maiden name at work. After this second Hislop made big news with The Island, fans might have expected more of the same from The Return, set around Granada during the Spanish Civil War. But for all its gypsy mood-music and charming star-crossed lovers, that book – once more a number-one bestseller – fused its battle-front romance with a pretty uncompromising view of the war. She presented it not as a vague bloody backcloth but a world-shaking collision between decent, democratic values and Franco’s brutal fascism. The Thread will again smuggle politics and history into the beach-bag and onto the weekend sofa. This time the focus – and a principal character – is the port city of Thessaloniki. Once the multi-cultural metropolis of Salonica, it became a Greek possession only when the moribund Ottoman empire yielded control in 1912-1913. Via a trademark Hislop time-shift, we drop back from the waterfront cafés of the modern city to 1917: year of the Great Fire that laid waste to old Salonica, and of the birth of the future couple whose path we trace through the upheavals of the Greek 20th century. “The first time I went to Thessaloniki,” Hislop remembers, “was to give a talk at the university, which is probably the least attractive building.” Soon, though, “I came to love that city.” The Thread voices that passion, with especially warm evocations of the Muslim and Jewish communities swept away by the fatal tides of history. We know from the off that our protagonists will eventually meet and marry. Dimitri is the idealistic son of a gruffly patriarchal cloth merchant; Katerina, a refugee from Asia Minor separated from her mother amid the chaos of the mass migrations, happily adopted and now a nimble-fingered seamstress for the Moreno family of Jewish tailors. Hislop guides us through decade after decade of modern Greek catastrophes. From the war with Turkey and the population exchange that ended it (Christians came to Greece; Muslims went to Turkey), through the anti-Nazi struggle and the vicious feuds of the civil war, right up to the Colonels’ dictatorship and its lingering legacy, we understand via set-piece climaxes and domestic interludes of repose just how much the nation in general, and this city in particular, have had to endure and overcome. With screens and newspapers now swarming with images of Greek unrest, Hislop hopes that her novel may help British readers to “see a bit below the surface” of today’s turmoil. “I learnt so much myself from doing the research,” she says. “I sympathise much more with why they are how they are.” For instance, when scolding Germans speak of debts and downgrades, many Greeks will think of the nation’s plundering by its Nazi occupiers. The Thread will entertain and enlighten legions of readers who, like it or not, would never pick up a historian such as Mark Mazower. Its oddly vehement political edge and fervent multicultural sympathies cut through the helpings of schmaltz and sentiment to generate Hislop’s characteristic sour-sweet flavour. That taste can clearly tickle the palate of millions. “I don’t think I’ve been unfair,” she says. “I hope it’s balanced. And at the end of the day, my motivation is to help the English-speaking reader understand the complexity of what’s gone on in that country. So I’ve done it with the best intentions – but, mostly, because I wanted to tell the story. One day, I’d like to write a story that comes out of my head… But meanwhile, I find these points in history – and it’s a case of joining the dots, really.” Or, to adopt the book’s signature imagery, of weaving the yarns of memory into a satisfying pattern “like the interwoven threads of an oriental rug”.